Apples, Pumpkins and Carrots, Oh My! Now that summer is really starting to fade away, apples, pumpkins, squash and other seasonal fruits and veggies are beginning to become the stars of many area menus. Whether you&apos;re craving a warm apple fritter, sweet and savory flatbread or seasonal beer, Howard County&apos;s restaurants and farms want you to get your fill of fall&apos;s favorite flavors. Many of these dishes are seasonal, so please consider checking when you visit as many restaurants change their menus often. The line for apple fritters at Larriland Farm is absolutely worth the wait. 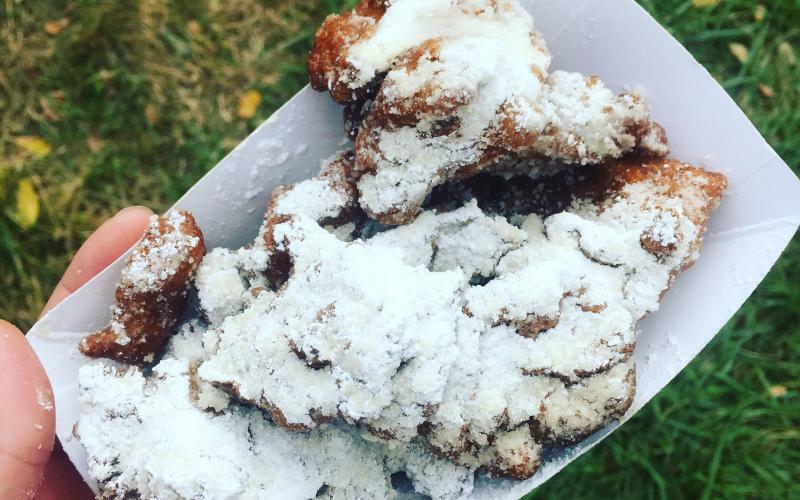 Perfectly doused with powdered sugar, they&apos;re the perfect post hayride or pumpkin picking treat. Not a huge fan of pumpkin, but in the mood to sip on something seasonal? Grab a pint of Jailbreak Brewing Company&apos;s Carrot Conspiracy. The Autumn Flatbread from Victoria Gastro Pub features roasted butternut squash, fig jam and goat cheese. Sure to satisfy any sweet and savory cravings. Satisfy a sweet tooth with some Pumpkin Pie Truffles from Sweet Cascades. Dig into something a little lighter at Alexandra&apos;s American Fusion. Their Spinach, Kale and Apple Salad features crunchy Granny Smith apples, walnuts and a yummy apple cider vinaigrette. Great Sage changes their menu seasonally and this fall&apos;s additions do not disappoint. The Autumn Crisp features roasted sweet potatoes, garlic spinach, roasted mushrooms, cashew cheese and pistachio pesto rolled in crisp phyllo and served over sautéed carrots and leeks in a white wine &apos;butter&apos; sauce. Seasons 52 has bite sized desserts in all sorts of fall flavors. Feel good about indulging in a mini pumpkin pie, pecan pie or carrot cake. Enjoy a cool Autumn meal lakeside at Petit Louis Bistro. Dig into some Pain Perdu (brioche french toast) with market apples and honey crème fraîche for brunch or sip on a happy hour cocktail paired with the Fromages plate served with grilled baguette and market apples. Apples and sausage are a perfect pairing that&apos;s often overlooked. The White Oak Tavern is serving smoked green apples with their chicken kielbasa this Fall.